Palestra is the Italian words for gym, but there aren’t a helluva lot of Italian gyms that are palaces. Visitors often decry the absence of the chains of American gyms that you find in America, but the fact is that in Rome reality is a gym and one of the most demanding ones you’re going to find. Let’s start with the famed Ara Coeli Steps on the Campidoglio--the best step climber on the market. Ascending strait up them to the Basilica di Santa Maria is a nice workout, but try ten of those. 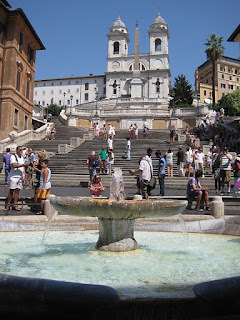 If you like stadium climbing, there’s the Colosseum and, of course, the Spanish Steps.Trastevere lies below the Gianicolo which is one of the seven hills of Rome and it’s a step climbing party. If you descend from the Pancrazio at the top and pass by the Spanish Academy in which Bramante’s famed Tempietto is located and then cross the street there are a particularly beautiful set of ancient steps descending into a classic winding back street. It’s 50 steps down and up and if you do l0 laps you've done 1000 which will commemorate the l000 years of the Empire. Then of course there are the 12 steps, but you'll have to attend an AA meeting, of which Rome has many, to climb those. Rome is full of runners and bicyclists and if you like hills and obstacle courses, Rome is the gym that you want to join.